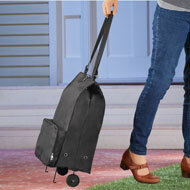 Take the strain off your arms and back with this handy cart that makes it easy to transport groceries, laundry, overnight essentials and other items indoors and outside. Lightweight and easytocarry, this shopping bag with wheels folds easily into it's own carrying case for storage and travel. Bag also has an outside pocket for additional storage and an adjustable handle strap. Polyester, plastic and iron; imported. 12" x 24" x 12". Organize your closet or add storage to any room in your home with this handy and portable organizer. It features 4 shelves on one side that are perfect for clothing, shoes and accessories plus two hanging bags for laundry. Hang garments along the top rack for easy accessibility. Easy to assemble. Iron, polyester and plastic; imported.  35 1/2"L x 17 1/4"W x 61 3/4"H.
Stop wrestling with those flimsy garbage bags – this handy trash bag holder keeps your trash bag upright and open while you work. It's simple to set up and adjusts to the perfect height so you don't have to bend down. Portable holder has a fliptop lid and collapses for easy storage. 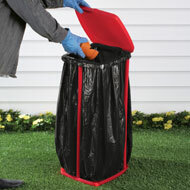 Holds trash bags up to 13 gallon size (not included). Plastic. 11 1/4"L x 12 1/2"W x 27"H.
Be prepared for any pot luck, picnic or family get together with this handy insulated food tote. 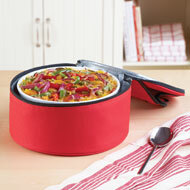 Foilinsulated to help keep food warm or cold, the spacious compartment is great for salads, casseroles and more. It zips closed and has a carrying handle. Spot clean. Foil paper, polyester and PVC. Round Insulated Carrying Tote 10"Dia. x 5"H.